The gift of five sheep from the Virabyans to the Ohanyans in a Passing on the Gift® (POG) ceremony also passes on hope in a seemingly hopeless situation in Lernantsk village, located in Armenias Lori Region. The Ohanyan family consists of six people. Hovhannes and his wife Shaghik, live with their son Saro, daughter-in-law Hermine and two grandchildren. Hovhannes and Shaghik are pensioners, while Hermine takes care of the children and runs the household. Saro, the only employed family member, works as a guard in a pine tree nursery established by his great-grandfather. In 2010, Heifer Armenia started the Agricultural Development Project in Spitak and Lernantsk Communities project in Armenias Lori region, which aims to improve the socioeconomic situation of needy families through the smallholder farms that feature sheep- and pig-breeding activities. 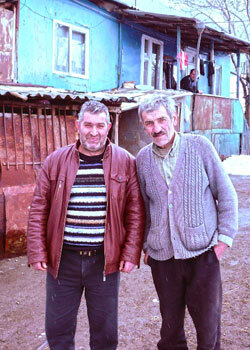 You can help farmers in Armenia improve their lives.